Printing with a balloon? Why not! 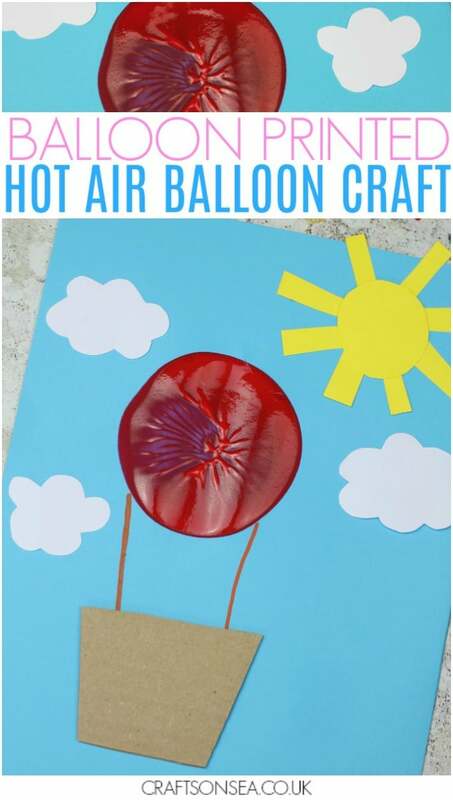 My kids often end up bringing balloons home from parties and I love the way this hot air balloon craft for kids gives them a bit of a second life. I’ve also got some suggestions at the end of the post for ways that you could change this craft to suit you and your kids too, let’s get started! Start by pouring some brightly coloured paint onto a plate, you want to use a colour that will show on the card once it’s dry so go for something bold. 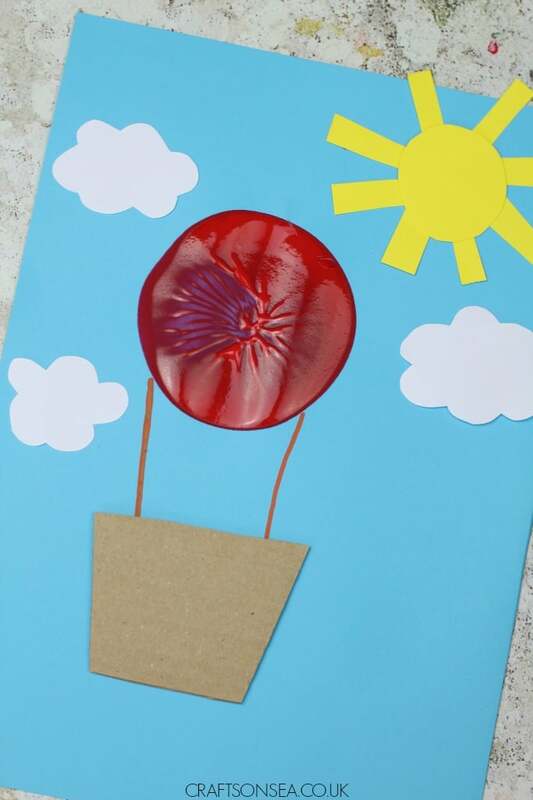 Using an inflated balloon dip the end of the balloon into the paint and give it a slight press down to ensure you get as much paint onto your balloon as possible and then press the balloon down onto your blue card where you want your hot air balloon to be. While you’re waiting for the paint to dry you can add your clouds and sun, these were cut out from coloured paper and then glued on. Next up you want to make the basket for your hot air balloon, mine was cut out from a box I’d had an Amazon delivery in. Finally draw in the ropes connecting the basket to the balloon, I used these which I find show much better than normal felt tip pens. 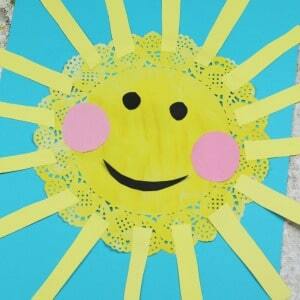 Like this craft? Make sure you bookmark this page or pin an image so you don’t forget this idea! Don’t have a cardboard delivery box? How about a cereal packet? 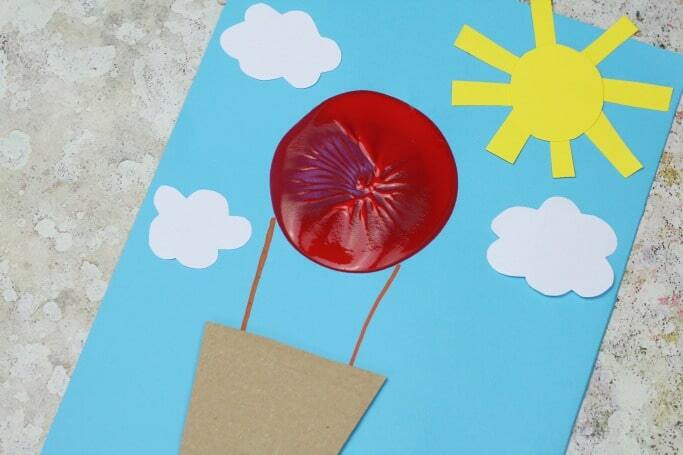 Why not change the weather, could your balloon cope with flying through a rainstorm? Why not add some people into your hot air balloon to go for a ride! 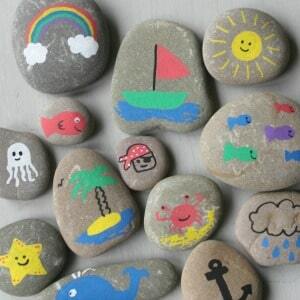 Or how about these ocean themed story stones, perfect for a bit of creative writing inspiration or if you make painted rocks to hide. 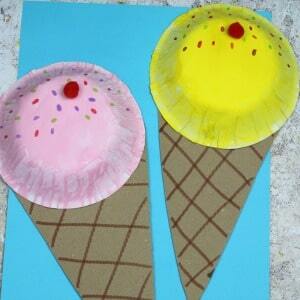 Finally these paper bowl ice creams are a fun summer craft and look fun hung up on the wall.